Tradition says that the city of Rome was founded in the mid-eighth century BC by Romulus and Remus, the twin brothers sons of Mars and Rhea Silvia. The ancient city was created through a progressive meeting of villages, built on the famous seven hills, in a single village inhabited by the ancient Romans. From the geographical point of view the Old Rome was placed on large flat areas, swampy valleys and hills lapped by the river Tiber. The peoples who inhabited these regions, used two major shopping streets, going from one coast to the inland area (Sabina) along the Tiber and was used primarily for the supply of salt (corresponds to the historical Via Salaria) who was then at the bottom of agricultural-pastoral economy and another road that ran along the route Etruria, Campania. 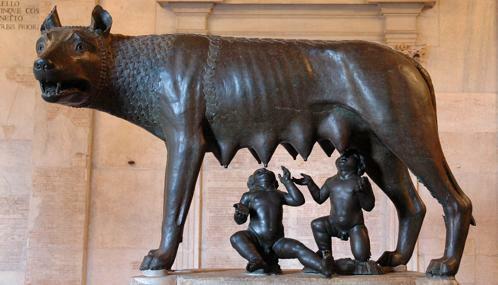 Romulus (753 BC 716 BC), remembered as the founder of ancient Rome. Numa Pompilius (715 BC 672 BC) who divided the year into twelve months also by regulating holidays and celebrations. This king also created the priestly college of the Vestal Virgins (young virgins chosen to become priestesses consecrated to the goddess Vesta) and the office of pontifex maximus (Roman religious figure). Ostilio Tullius (672 BC 640 BC) the famous king who conquered Alba Longa defeating the Sabines. Anco Marzio (640 BC 616 BC) continued the work of expansion of the Lazio region and founded the first colony at Ostia. Tarquinius Priscus (616 BC 579 BC), Servius Tullius (578 BC 535 BC) and Tarquinius Superbus (535 BC 509 BC) were the Etruscan kings and under these rulers the city evolved considerably. In the period from 509 BC and 27 BC Rome and the conquered territories were organized in the State of the Roman Republic. In this period Rome went trough profound changes, becoming, little by little, the capital of a large state composed of many different people and different civilizations: the beginning of the Roman Empire. The Roman Empire consolidated between the first century BC and A. D. IV. The Empire begins in 27 BC with the principality of Octavian Augustus and ends in 395 AD with the death of Theodosius. According to tradition Rome was built on seven hills , all located East of the river Tiber. These seven hills would represent so the heart of the city. The seven hills are the Aventine, the Capitoline, the Caelian, the Esquiline, the Palatine, the Quirinal and the Viminal. These hills played a very important role on the mythology, religion and politics of the ancient Romans. According to tradition the city was founded by Romulus on the Palatine hill. In fact right on the top and at the foot of this hill several finds have been found, that could be dated back to the age of the first urban settlements. These finds can be easily admired in Palatine museum. Indeed the Palatine area turned out to be inhabited since the I millennium B.C. It was originally just a small village surrounded by wetlands. This first urban agglomerate, stayed almost unchanged for a couple of centuries, it was the so-called “Square Rome”, because of the roughly rhomboidal shape of the top of the hill it was located on. 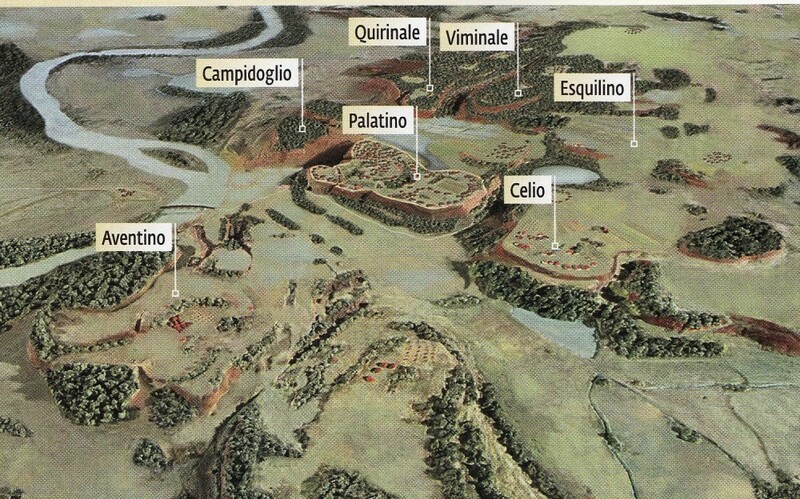 The development, in the VIII century B.C., of the original unit and the fusion with the tribes located nearby originated that city of the seven hills, however they were not the traditionally known seven hills, but just some minor heights , that are the two of the Palatine hill, the Caelian and the Velian and the three western heights of the Esquiline. Only since the IV century B.C., thanks to the raising of the walls built under the reign of the king Servius Tullius, a developed city was enclosed that contained also other hills , that is the traditional seven hills. Seven is a recurrent number in the Roman mythology. The Latin term Septimontium (that means seven hills) was used by the ancient Romans to celebrate a religious festival in the area of the seven hills, that would be exactly the area of Rome. Since the ancient times a special festival related to the seven hills was created, it seems by Numa Pompilius, the second king of Rome after Romulus. This festival is a long procession along the seven hills with some sacrifices to celebrate near the 27 sepulchres of the Argei, that were placed on those hills. According to tradition the Argei were the heroic Greek princes who, arrived in Latium following Hercules, conquered the hills where Sicily and Liguria populations stayed, which later Rome was built on.